Stevo and I have recently re-discovered ear candling, which I think has been around for a very long time. It’s not uncommon to learn techniques like this and in the busy way life gets you forget to use some of the tools in your arsenal. But then, just when you need it, the tool presents itself again. It’s easy to learn the technique and Carol just found a great book about it while she was in Tucson. 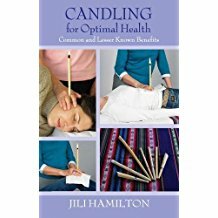 It’s called “Candling for Optimal Health” by Jili Hamilton. Stevo has found that the candling seems to be pulling toxins from all over his body. In the book, she explains that the candling activates the lymph system, which is the waste removal system of the body. So it makes sense to me that using the candles can do that kind of action all over the body. I think the physical detox also stimulates a spiritual detox, especially if you do the Emotional Stress Release technique at the same time. And, you have to breathe deeply the whole time. Lying there with the candle in your ear is a great time to breathe and release stress as you can’t do anything else while you’re candling. Well, I suppose you could watch a movie or listen to music, but I think you get more out of the process if you have some quiet time and do some emotional release. The other really important thing here is to use natural beeswax candles, not paraffin candles. Paraffin is a petrochemical product and will only introduce more toxins into your body. “De-toxing” has kind of become a meme lately, but it’s really an important step in your spiritual evolution, I believe. Try it and see what you think! This reminds me some traditional Chinese medicine techniques using fire. They say that the fire colour is different over diseased areas.